The house is officially listed for sale. You can see it on here if you're so inclined! Hey, you can buy it too... if you're so inclined. It's a lovely house! I love it and am going to miss it. But it gives me opportunity to have a better set up for my studio/quilting machine. I currently have my quilting machine in the building behind the house with a sewing machine area cramped up in the corner. Then I have the remainder of my sewing area in the spare bedroom. Oh and the overflow from that in the walk in closet in the hall across from the bedroom. I am looking forward to that in DeKalb. So since I'm through cleaning.... for now.... and all I have to do is keep it picked up.... FAT CHANCE OF THAT....I can get back to more quilting. YAY!!! 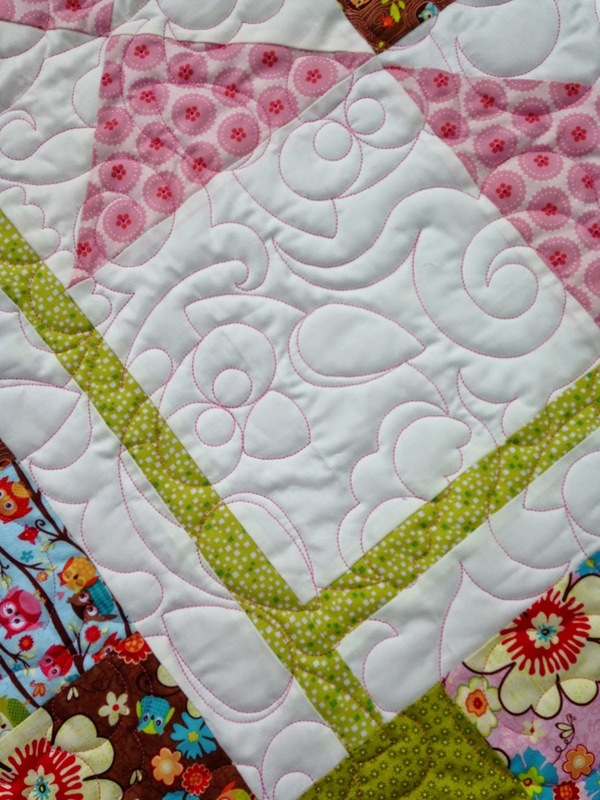 Isn't this the sweetest little baby quilt. 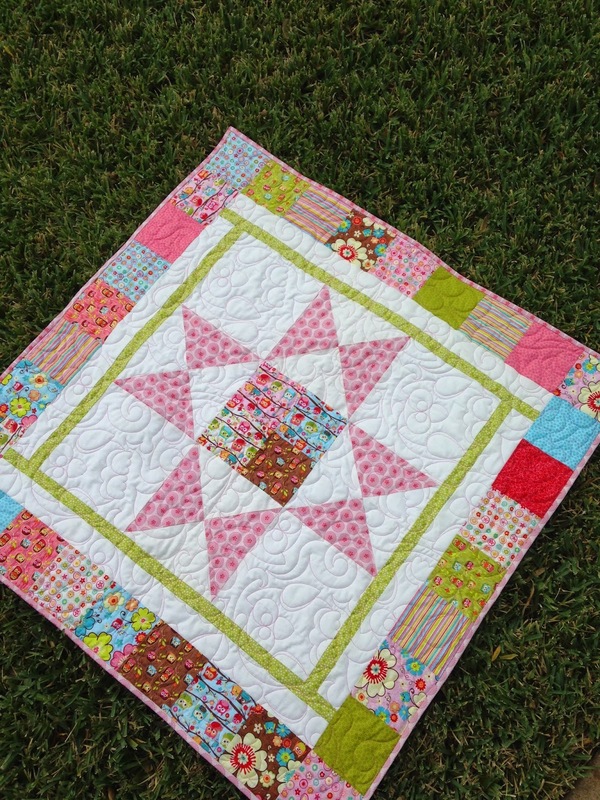 Debora made a simple oversized Ohio Star and a charm pack around the edges for a border and the center of the Ohio Star. I quilted owls in Glide pink Thread to coordinate with the ow themed fabric in the quilt. Pat is a new customer to the Quilting Queen. 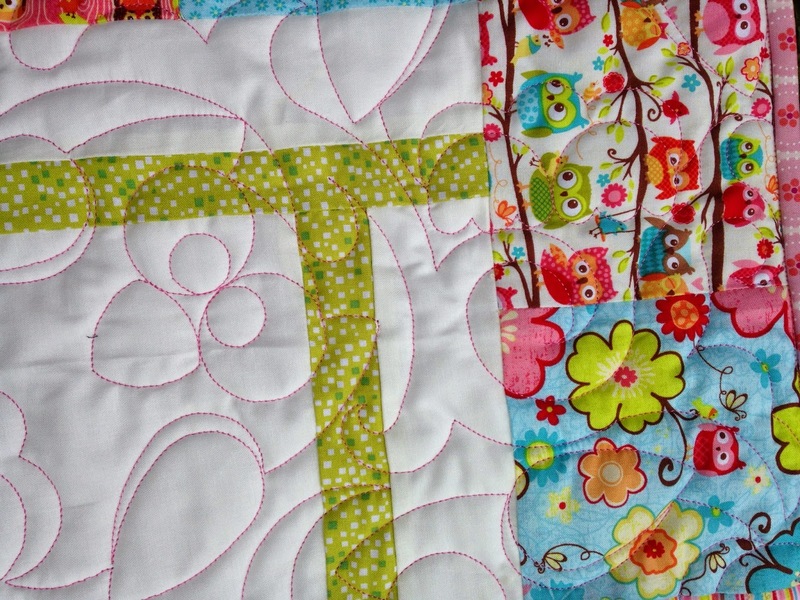 This is a mini quilt from the Little Jo's club. The quilt is only 21" square. 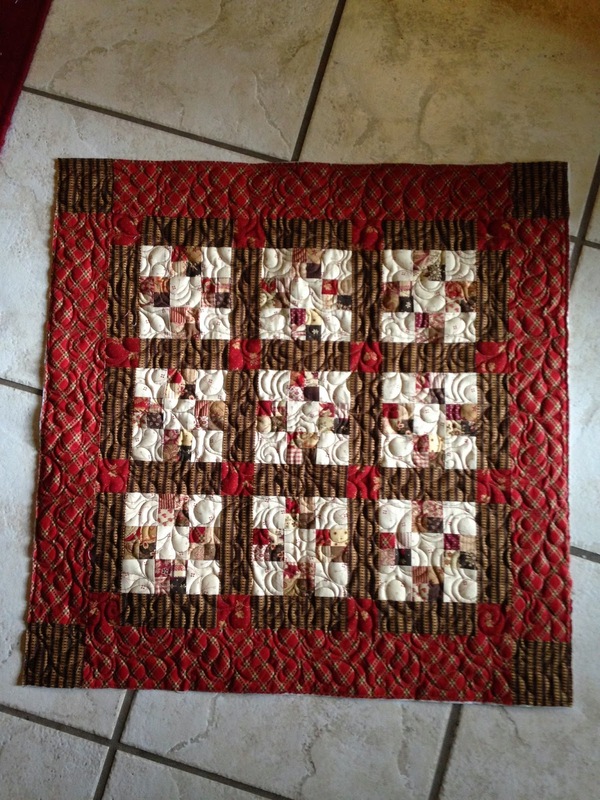 I quilted "Deb's Feathers" in Latte thread. I scaled the feather pattern down a bit for the mini quilt. Pat's second Little Jo's Club quilt is this basket quilt. She needle turned the baskets; I'm so envious! I really like her choice of setting triangles in the blue. 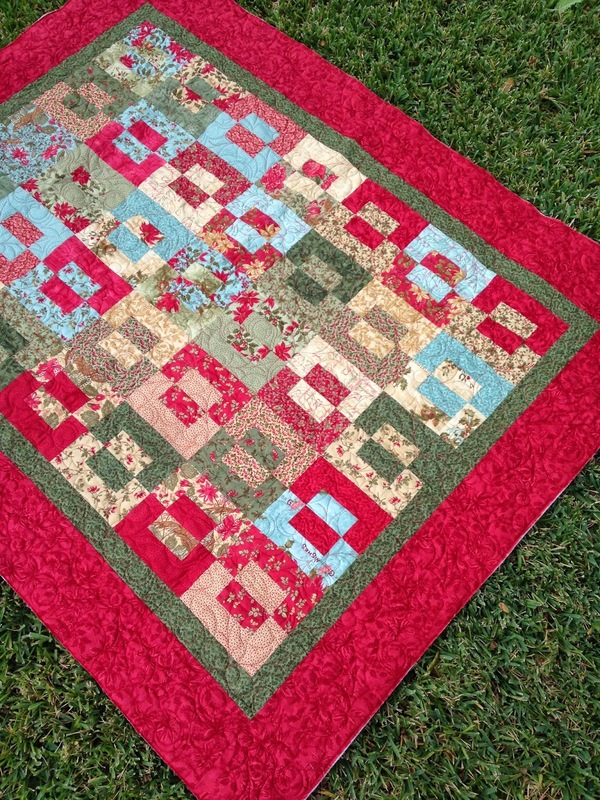 I quilted the pattern "Cotton Candy" in Latte thread on this one too. 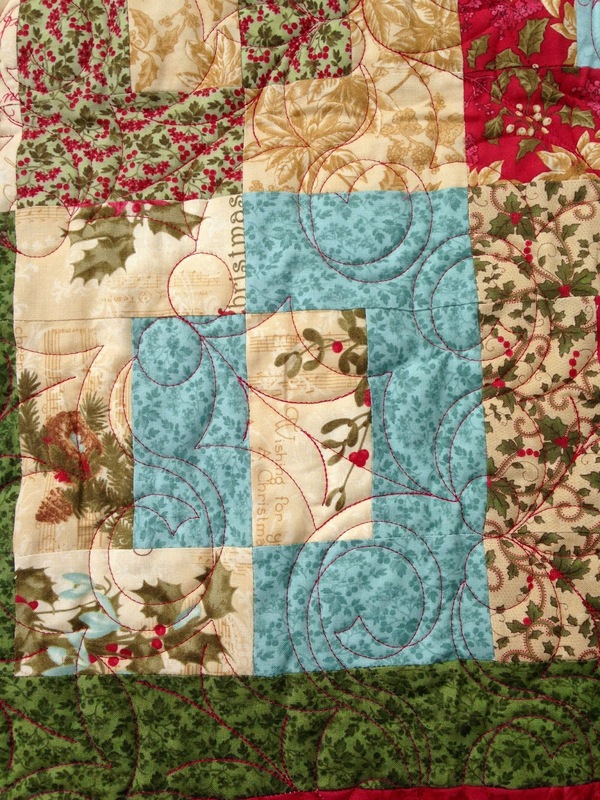 And Pat's last quilt she brought me is this simple lap quilt in Christmas colors using the Bento Box pattern. This quilt may look familiar to you as Kathleen made this same quilt last month and I quilted it. Pat saw it and loved it so here we are again. Makes my job easy! 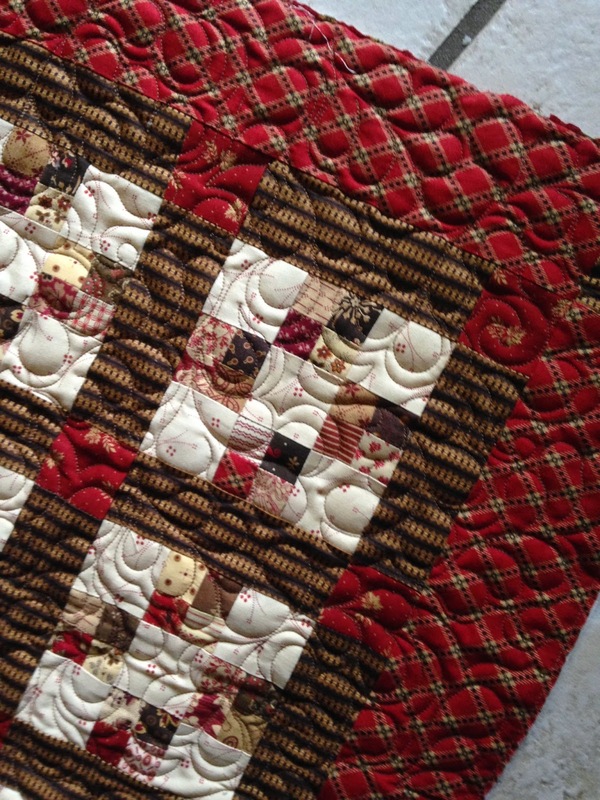 A Holly pattern in Candy Apply Red Glide thread was quilted on this one. Your current home is lovely - especially loved the quilts on the beds!! Good luck in getting it sold quickly! !